A new initiative aims to make the U.S. the global leader in advanced nuclear reactors poised to hit the market in the coming years. Belarusian and Russian national flags are seen at the construction site of the very first Belarusian nuclear power plant, which will have two power-generating units, near the town of Ostrovets, Belarus October 10, 2018. The Trump administration is preparing a new push to help American companies compete in the race to build the next generation of nuclear power plants around the world — a competition the U.S. is currently losing. The State Department plans to expand cooperation with countries pursuing atomic energy long before those nations ever purchase a nuclear reactor. By facilitating early stage talks, the U.S. intends to put American companies first in line to build tomorrow's fleet of nuclear power plants overseas. To be sure, the Energy and Commerce departments actively facilitate U.S. nuclear cooperation with their foreign counterparts. But the State Department now intends to push the issue in talks at the highest levels of government, making it clear that Washington believes cooperation in the nuclear realm is central to its strategic relationships. But even with the State Department lending its diplomatic heft, winning nuclear energy contracts won't be easy. Russia and China are aggressively pursuing those deals at a time when the U.S. has struggled to build reactors at home and no longer enriches uranium to fuel those facilities. "We have lost tremendous ground. We were once 90 percent of the market globally. We're down to 20 [percent] if we're lucky," Ed McGinnis, the Department of Energy's principal deputy assistant secretary for nuclear energy, said in an interview. "The majority of the big 80- to 100-year nuclear power deals being made overseas are Russian and Chinese and other state-owned corporations," said McGinnis, who has worked in government on nuclear energy and nonproliferation issues for 27 years. The U.S. dominated nuclear energy exports decades ago, but faces stiff competition today, including from allies like France and South Korea. But it's the growing dominance of adversaries in Beijing and Moscow that worries the Trump administration and nonproliferation experts. 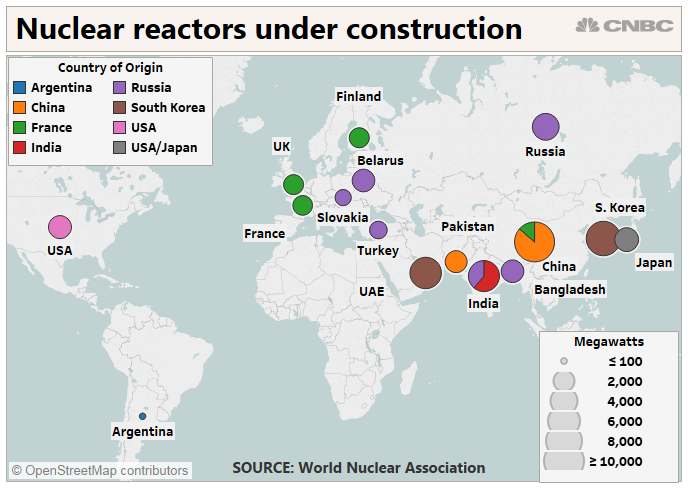 China is building more reactors at home than any other country, and its state-owned nuclear companies are beginning to enter the international market in Pakistan, Argentina and the UK. Russia's Rosatom, already an established exporter, is providing reactors for plants in Eastern Europe, India, Bangladesh and Turkey. Ford previewed that message last month at the Hudson Institute in Washington DC: "Russia and China also use reactor sales by their heavily state-supported nuclear industries as a geopolitical tool to deepen political relationships with partner countries, to foster energy dependence by foreign partners, and sometimes even to use predatory financing to lure foreign political leaderships into 'debt traps' that give Beijing or Moscow leverage that it can exploit later for geopolitical advantage." During the address, Ford outlined State's plan to help American companies compete with Chinese and Russian firms. The State Department will do this by signing nuclear cooperation memorandums of understanding with the countries. Under the MOUs, American experts would help foreign nations develop the apparatus necessary to accommodate a nuclear energy industry. That includes creating safety, security and non-proliferation protocols, as well as an independent regulatory system. That will make more countries "fully prepared to take advantage of the emerging technologies and coming innovations in reactor design and other areas that are being pioneered in the United States," Ford said. That marks a change from the past, said Ted Jones, director for national security and international programs at the Nuclear Energy Institute, the industry's main trade group. "We've long urged greater coordination among the many agencies involved in U.S. nuclear exports and a genuinely strategic approach to U.S. nuclear cooperation," he said. "The State Department's plans for nuclear cooperation MOUs indicate that this Administration is moving in the right direction." There has long been an instinct within U.S. foreign policy circles to limit nuclear energy exports, if only to reduce the risk that those transfers will open the door to nuclear weapons proliferation. But if the U.S. continues to lose sales to other countries, its ability to set strong nonproliferation standards around the world will fade. Primary coolant pumps assembled by St Petersburg's Central Mechanical Engineering Design Bureau, a member of the Atomenergomash company group, and shipped to the Belarusian nuclear power plant. The State Department now plans to address nuclear energy cooperation in high-level meetings with presidents, prime ministers and foreign ministers, a senior State Department official told CNBC. The department is currently drawing up priorities with two major considerations in mind, the official said. First, the State Department is identifying geostrategic opportunities, with a focus on the parts of the world where the U.S. is at risk of losing bids to rivals like Russia and China. Second, the government will consult nuclear energy companies about where they see the brightest opportunities and the best chances of closing deals. The industry is already on board with State's new initiative. The Nuclear Energy Institute regularly polls members on where they see opportunities overseas. In the survey that went out a few weeks ago, NEI asked members to identify their long-term market opportunities, a question that is consistent with the State Department initiative. State's focus is on teeing up sales of a new generation of nuclear technology expected to come online in the next five to 10 years, the official said. Those include small modular reactors that can be bolted together to form larger units, Terrapower's traveling wave reactor backed by Bill Gates and microreactors meant to provide enough power for a few thousand homes. Altogether, there are about two dozen serious designs for advanced nuclear reactors trying to break into the market, said McGinnis. Under McGinnis and Secretary Rick Perry, one of the Energy Department's top priorities is facilitating the development of these new technologies. "We still lead the world in nuclear technology innovation," he said. "Our big challenge is taking that incredible IP and those incredible technological innovative breakthroughs and bringing them to market. That's been our challenge." These agreements have recently drawn scrutiny from Democratic and Republican lawmakers as Westinghouse bids for nuclear power contracts in Saudi Arabia. The Saudis have long insisted on their right to enrich uranium, something the U.S. usually opposes. The bidding also comes as tension between Riyadh and Capitol Hill has escalated after Saudi agents killed Washington Post columnist Jamal Khashoggi in October. The United States has signed about two dozen 123 Agreements, but Jones says those don't come close to addressing the potential global market for next generation technology, especially as smaller reactors make nuclear energy more accessible. There are currently about 30 countries considering adopting nuclear energy, according to the World Nuclear Association. "Given that Russia and China are aggressively seeking to tie up commitments from countries in these future markets, it behooves the United States to take an active role in nuclear cooperation before countries are ready to engage in 123 agreements," Jones said.